Plant Manager at #Fukushima I NPP on Highly Contaminated Water Routed to Wrong Buildings: "We Will Make Pump Switches Tamper-Proof"
Mr. Akira Ono, current plant manager at Fukushima I Nuclear Power Plant, hasn't struck me as one of the brightest at TEPCO, but his "solution" to the problem defeats the whole purpose of having the temporary pumps in those buildings - which is to make those pumps readily accessible and operational in case of an emergency that necessitates those pumps. TEPCO announced on April 14 that contaminated water had been routed to wrong buildings, and explained the cause as the transfer pumps having been turned on. The pumps usually remain "off". Plant Manager Ono told the press that it was true that the pumps had been turned on for some reason, and that TEPCO would investigate and come up with countermeasures. As it stands, the possibility cannot be excluded that someone had turned on the pumps not by mistake but intentionally. Mr. Ono said he would like to set up a control system whereby no one can tamper with [the pump switches]. Reuters has the English article (4/17/2014) that pretty much covers what Reuters Japan's article covers, but Ono's above comment is missing. Instead, it has Ono's comment that TEPCO has put speed first, instead of quality. Well, as if it had a choice back in March and April in 2011.
which is quoted by other US media (including MSNBC), with the emphasis (naturally) on "we don't have full control." 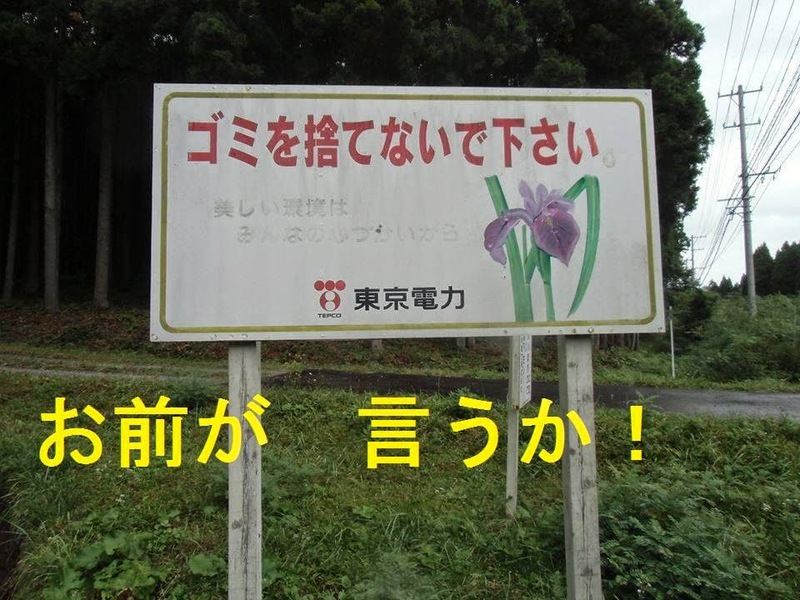 (OT) TEPCO's Old Billboard Message: "Please Do Not Litter, Keep Environment Clean"
It looks like an old sign, way before the Fukushima nuclear accident in 2011. Smaller letters are fading. 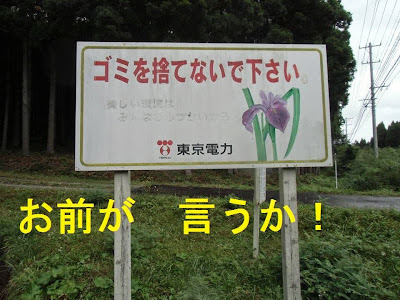 TEPCO: Please do not litter (or literally, please do not throw out garbage). Pristine environment starts with your kind consideration. Anonymous message in yellow letters: For you to say! In fact, one of the long-time workers who tweet from Fukushima I Nuclear Power Plant, "Sunny", seems to suspect a 'foul play'. When I first read the document TEPCO submitted to Nuclear Regulation Authority regarding this incident two days ago, I simply could not comprehend. After reading equally incomprehensible accounts by the mainstream newspapers, NHK (link won't last), and TEPCO's press release (4/16/2014), I think I have finally figured it out. 1. The water gets highly contaminated after it is injected into the reactor pressure vessels and comes in contact with the corium. The water accumulates in the basements of the reactor buildings, then it leaks into the adjacent turbine building basements. 2. From there, the water is normally routed to the Central Waste Building for storage. 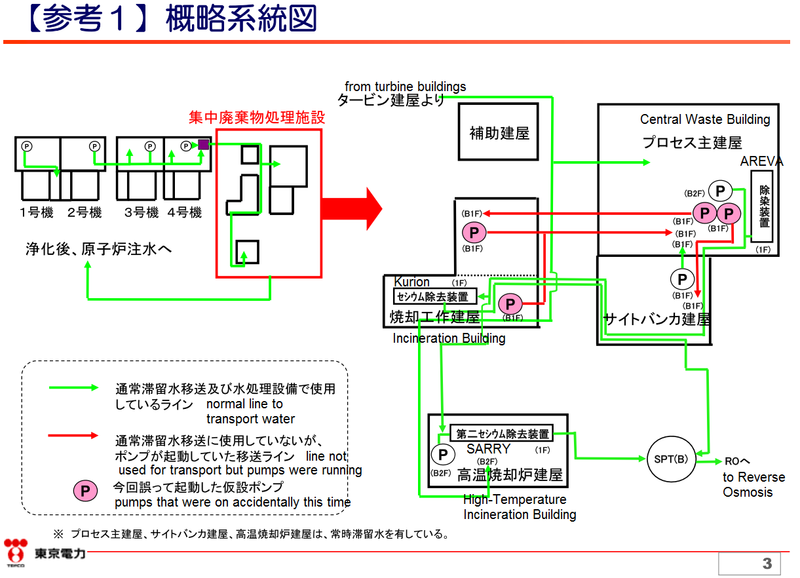 From the Central Waste Building, the water then goes to the cesium absorption system (either SARRY in the High-Temperature Incineration Building or Kurion in the Incineration Building) for treatment (removing cesium). 3. HOWEVER, on April 10, a temporary pump installed in the Central Waste Building was turned on by someone, and this highly contaminated water (Cs-134 at 10 million Bq/L, Cs-137 at 27 million Bq/L) was pumped from this building into the Site Bunker Building. There was yet another temporary pump in the Central Waste Building, and that pump was also turned on by someone. The contaminated water started to be pumped into the Incineration Building, which is not supposed to store this highly contaminated water. 4. There were two temporary pumps in the Incineration Building itself, which were also turned on by someone, and they started pumping the contaminated water back into the Central Waste Building. As all these were happening, TEPCO kept wondering why the water level in the Central Waste Building was lower than it should, and the water level in the Site Bunker Building was higher than it should. 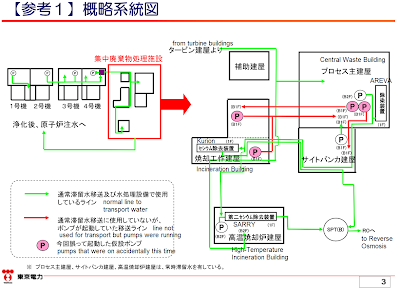 In the early morning of April 13, TEPCO finally figured out that the temporary pumps were running, but it took them nearly 12 hours to finally stopped the pumps (from TEPCO's press release 6/16/2014, timeline on page 3). By then, 200 tonnes of highly contaminated water was diverted to locations that shouldn't have received any such water. TEPCO says it didn't occur to them to check those temporary pumps sooner, because they were not supposed to be on. There was nothing mechanically wrong with the temporary pumps, according to TEPCO. It is probably not a human error. In other words, someone did it on purpose. I'm convinced. It was "intentional". Just like in the incident in February this year when the "wrong" valve was opened to let the highly contaminated (beta nuclides) waste water overflow from the top of the tank, TEPCO says it is investigating. Just like then, it is likely that the investigation will fail to identify the cause (or the culprit), and TEPCO will simply stop the investigation. I tweeted and wondered if this was an act of sabotage. With shortage of workers at Fukushima I Nuclear Power Plant, there may be workers who go there for the express purpose of "making the point" - in this case, and in the case in February, to show how vulnerable and dangerous the plant is - by actually causing the problems like this. But this is a country where a 30-year-old so-called researcher can appear in front of the cameras and shed tears carefully (not to smear her perfect makeup) and insist it was an innocent mistake, and male so-called journalists and even scientists fall for her and forgive her for her fraud of faking the data in the doctoral thesis and the paper in the so-called peer-review science magazine. This must also be an innocent mistake by an inexperienced worker who has been sent to Fukushima I NPP by a yakuza head-hunter and is being exploited by the subcontractor but who happens to know exactly what switches to flip to turn on the pumps that should not be on. 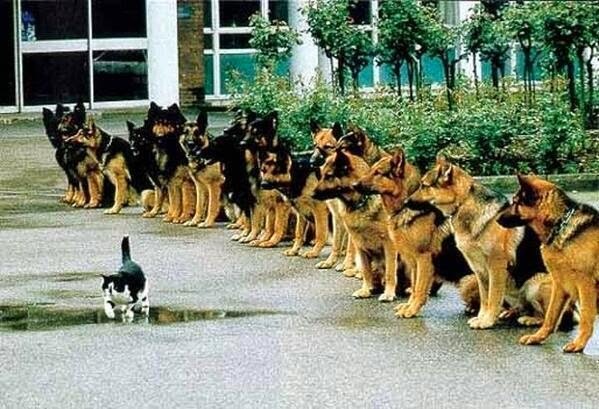 I'm impressed with the cat, being able to calmly walk past the dogs.